Capcom has never been shy about banking on their name brand franchises when the popularity is there, as Street Fighter and (until recently) Mega Man fans can attest. Two versions of Marvel vs. Capcom 3 in less than a year, multiple revisions of Street Fighter IV and re-releasing the first four console Resident Evil games across practically any platform that would take them proves this to be… basically their core business model, if nothing else. 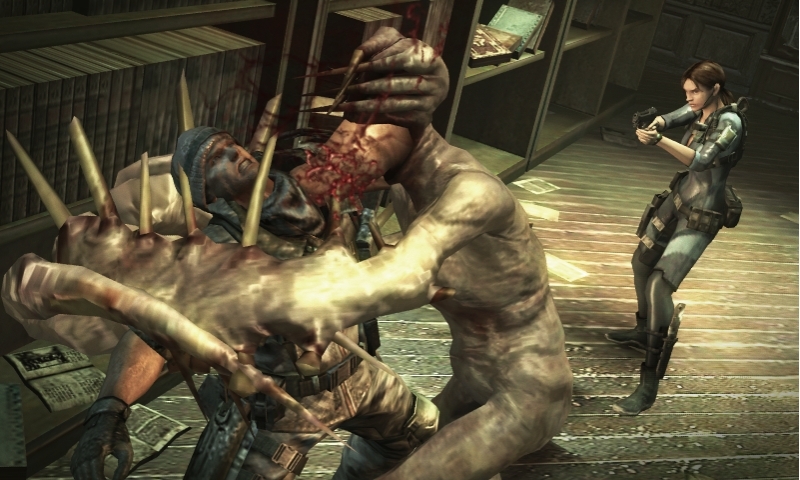 As such, while it’s certainly a little weird to realize there are THREE Resident Evil titles coming out in the calendar year of 2012, it’s by no means surprising, given that Capcom knows the brand is popular and people love killing the undead. 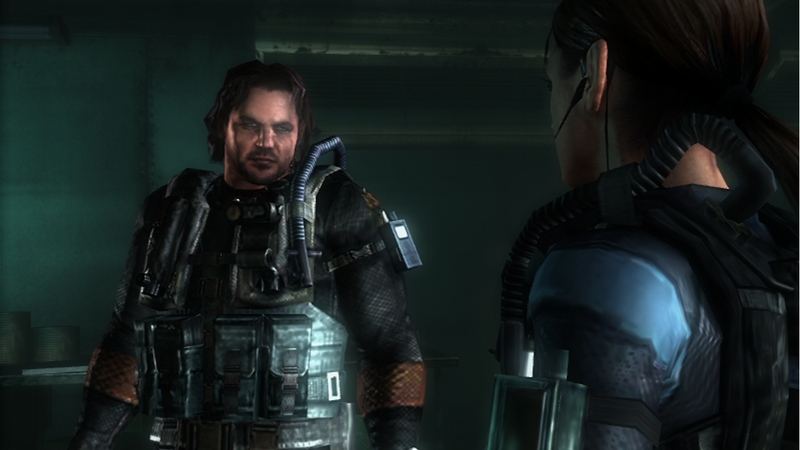 We’ve seen the first release for the year, Resident Evil: Revelations, in various stages throughout the last several months, from its showing at E3 to the timed demo included in Resident Evil: The Mercenaries 3D and, not too long ago, in a demo released to the Nintendo eShop, and it’s certainly been promising each time. 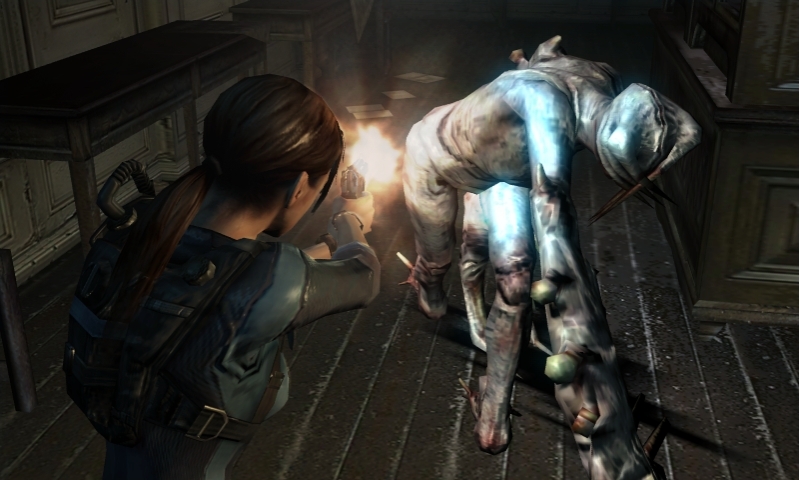 Promising a fully functional handheld Resident Evil experience and support for Nintendo’s Circle Pad Pro, among other things, Resident Evil: Revelations was basically looking to be a hot title for the 3DS, an exclusive release that takes full advantage of the console and can be considered a “system selling”Â release. Now that it’s finally here and available, however… it pretty much pays off all of those expectations, and starts Capcom off on the right foot with their Resident Evil releases, as it’s pretty fantastic all around. 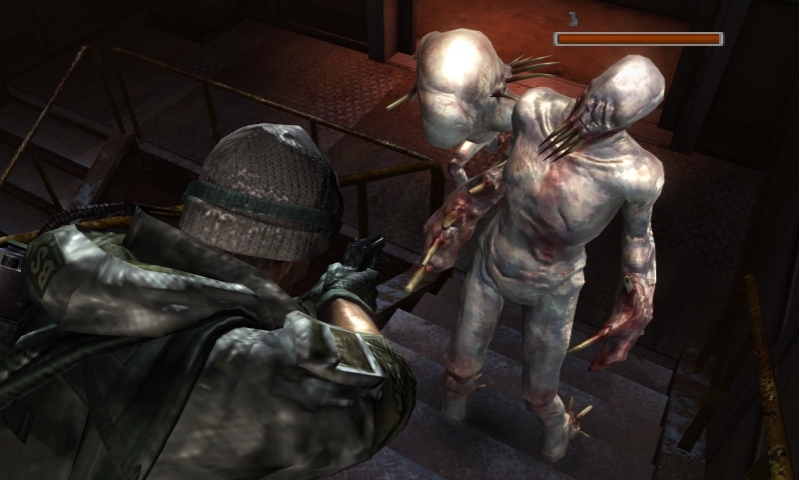 The events of Resident Evil: Revelations take place in 2005, apparently, and are set as taking place between the events of Resident Evil 4 and Resident Evil 5. The setup is that, back in 2004, the artificial island nation of Terragrigia was hit with a Bio Organic Weapon attack by a terrorist group identified as Veltro as some sort of demonstration against Terragrigia’s reliance on solar energy. The end result is that the island is deemed non-salvageable, those who are still alive are evacuated, and the island is hit with a direct shot from the Regia Solis, a giant orbital solar beam cannon, destroying the entire city, which is then declared a biohazard zone in the aftermath. 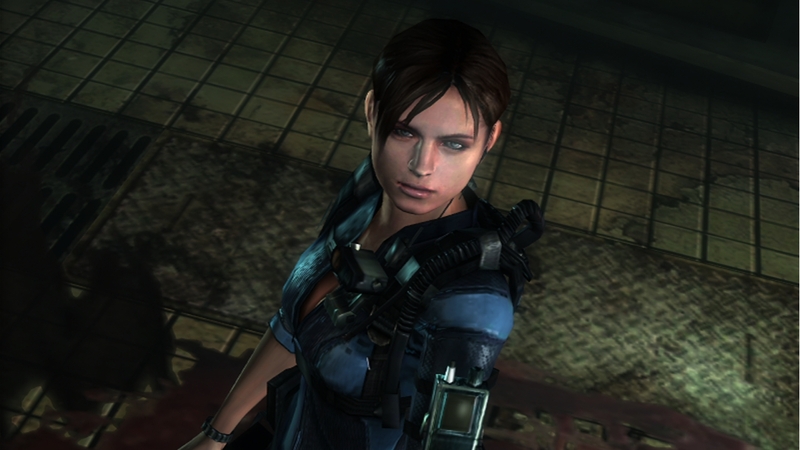 A year later, Jill Valentine and her partner Parker Luciani are sent to investigate a boat, the Queen Zenobia, in search of Chris Redfield and his partner Jessica Sherawat. 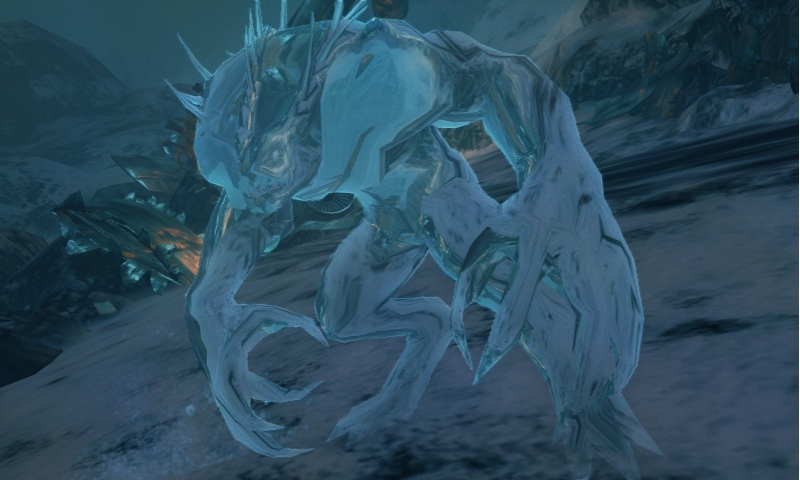 It turns out the boat is filled with a fairly sizable contingent of monsters infected with what is dubbed the T-Abyss virus, and also is apparently some type of staging platform for another terrorist attack from the revived Veltro group, as they’re intending to use the T-Abyss virus to make a lot of people dead. 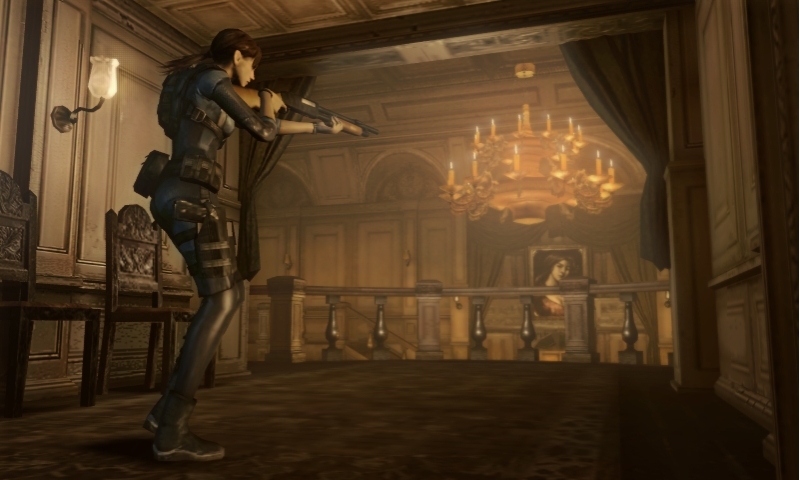 The plot bounces around between Chris, Jill, Parker and Jessica, among others, as the twists and turns become more complex and the situation becomes more tense, and the end result is one of the more involved Resident Evil plots in a while. 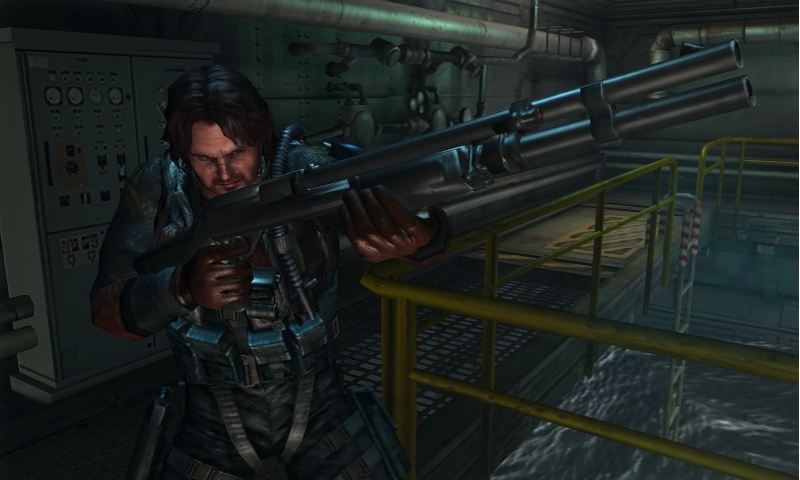 It’s kind of weird to look at the plot for Resident Evil: Revelations and reflect on the idea that the technology levels for this game in particular are significantly more advanced than they are in our own world, especially when (aside from the odd laser cannon here and there) the prior games never really made this obvious, but that aside, the plot is pretty fun. The storyline is presented in a serial television sort of way, where each chapter and each time you load your game you’re treated to a “Previously on…”Â lead-in, which is cute, if nothing else, and keeps the plot fresh in your mind as you play. 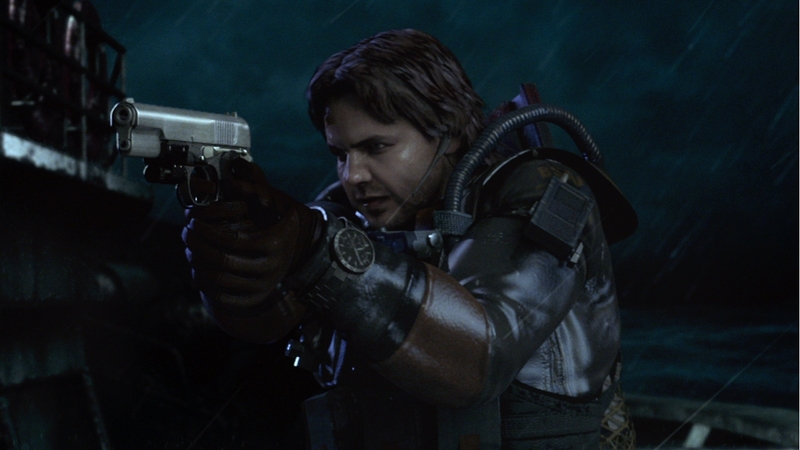 Granted, it’s still a Resident Evil plot, so it’s a little silly and the pseudo-science doesn’t really make a lot of sense, but it’s well told and enjoyable on a level that makes you want to see it through to the end, and it ties the events together well enough to be understandable. 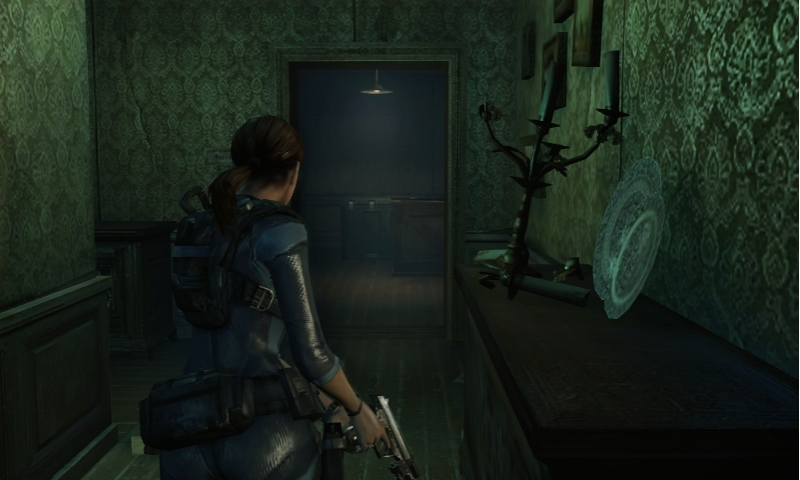 Resident Evil: Revelations is one of the best looking games to come out on the 3DS so far, on both a technical and artistic level. 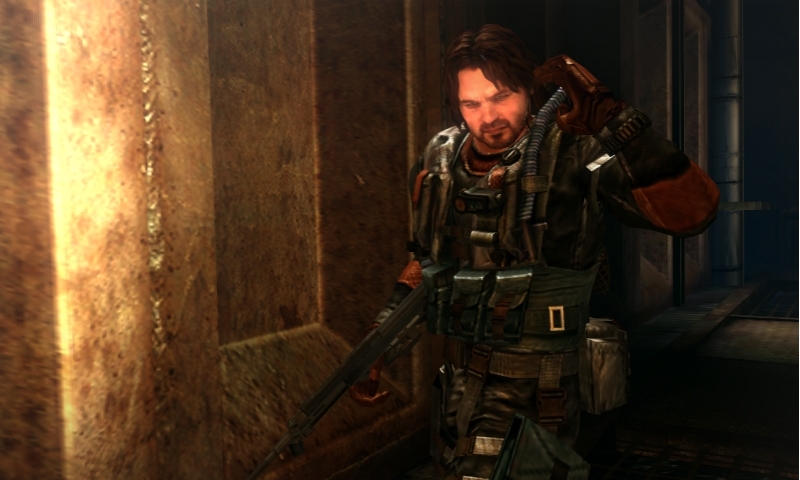 Technically, the characters move and animate well and the textures are generally high quality throughout the game, regardless of what location you find yourself in. 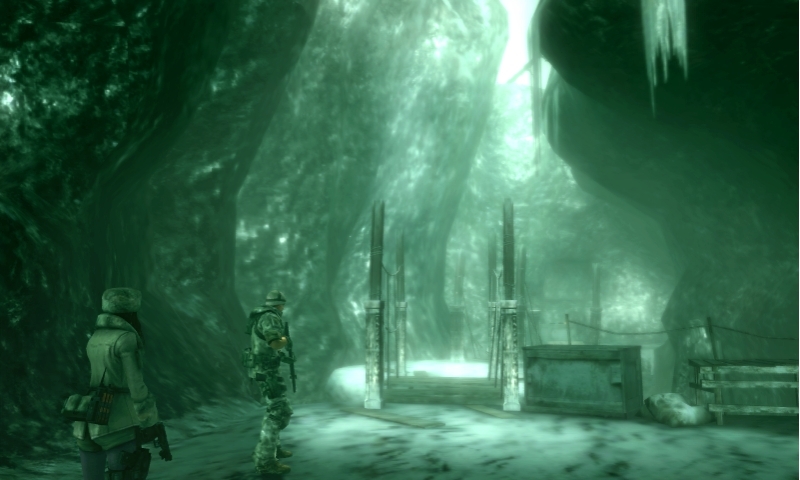 The game also makes good use of lighting and environmental effects, giving the game a solid atmosphere that sells the experience well. Artistically, the game meshes the different environments you go through together well, between snowy canyons, office buildings, and the cruise ship that gives off a distinctly old-school Umbrella vibe as you traverse it. 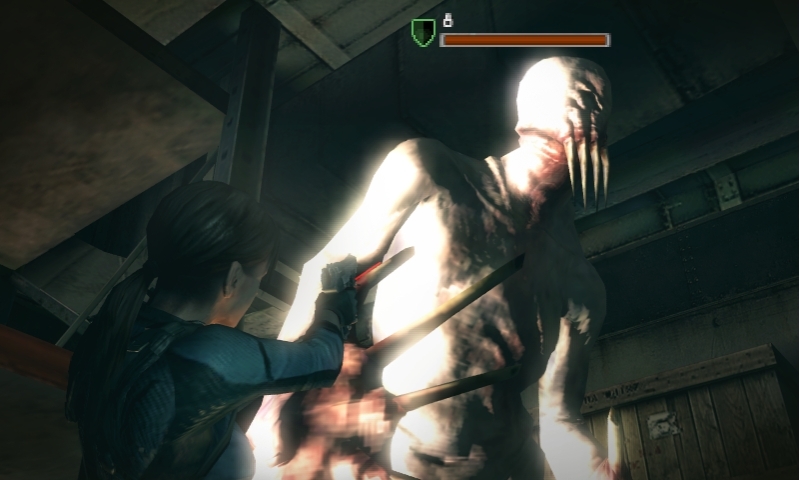 The 3D effects are also excellent, as the game gives you a wide 3D range to work with when adjusting, and the effect itself is subtle but very effective, especially in first person aiming, though since you’ll be using the touch screen a lot it can be hard to adjust between the two screens when using it. Unfortunately, there are some visual hiccups during loading sequences, and some of the design choices are weird (Jessica’s weird one leg bare wetsuit comes to mind), but these are minor issues overall. Aurally, the game is also outstanding. 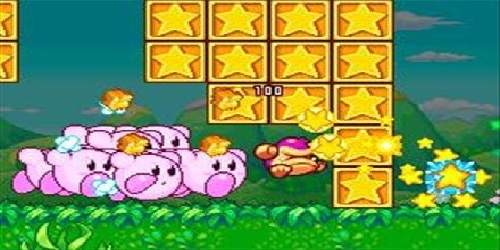 The game music follows the standard trend of its franchise, featuring excellently composed pieces that contribute to the dread or tension of a scene nicely, and all of the in-game tracks are well assembled and inserted into the game. The game offers both English and Japanese voice acting, which is great in general and for a 3DS title, and both voice casts do a good job with what they’re given. 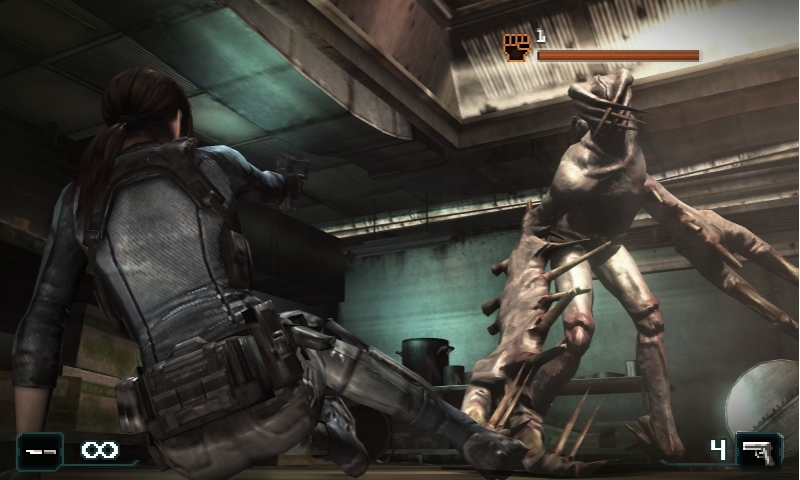 The sound effects are also pretty fantastic, and while the monsters you face aren’t as varied in vocal effects as the infected in, say, Resident Evil 5, they still manage to sound pretty imposing over the convincing backdrop of your gunfire. 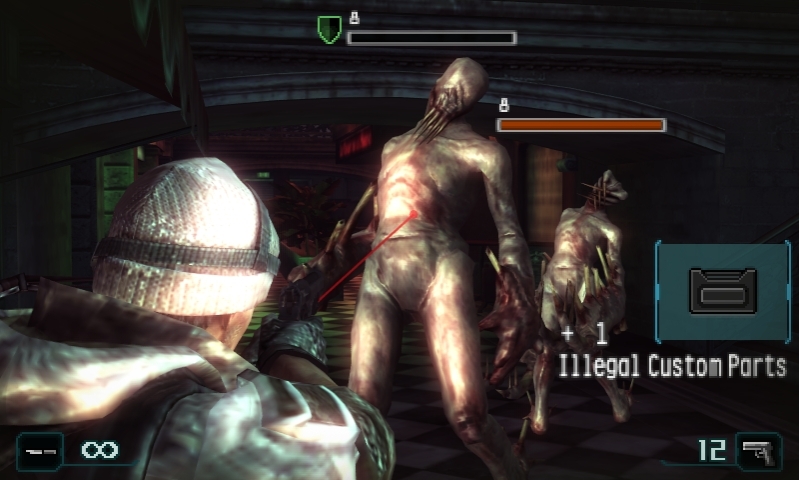 The gameplay in Resident Evil: Revelation generally works about as well as one would expect, though the mechanics have been changed around a little to accommodate the 3DS interface. When using the 3DS on its own you can set the game up in a couple different ways to allow you to move around, either by using the standard “tank controls”Â of the older games or by allowing you to move entirely with the left stick while turning with other buttons. You can also acquire the Circle Pad Pro device, which will allow you to use the left stick for movement and the right stick for turning and aiming, which makes the 3DS a little more bulky, but also makes the controls a bit more natural. Either way, however, the controls are somewhat simplified from those of their console counterparts. 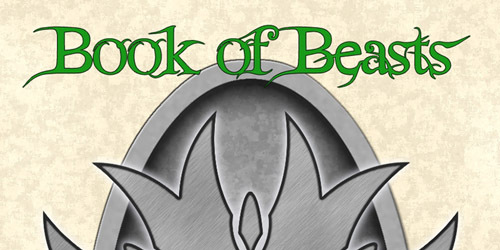 A button is hotkeyed to using healing herbs instead of forcing the player to putz around with them in the inventory, and you can also reload with a press of the button. Aiming and firing is relegated to the triggers in most cases, though you’ll also have a sub-weapon you can use as needed. 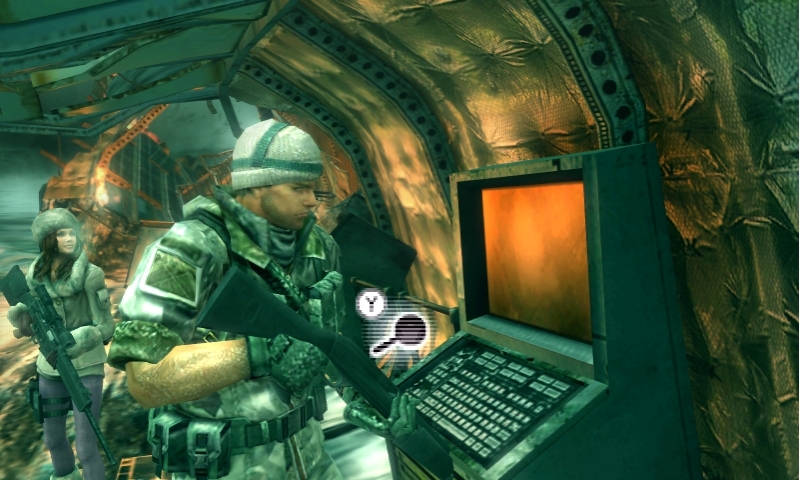 Weapons and sub-weapons can be changed with the D-Pad or by tapping the appropriate icons on the touch screen, and you can also open the inventory from the touch screen to inspect the various items on your person as needed, as well as inspect a full map of your location, though a partial map is displayed on the touch screen at all times. You can also aim from first or third person views, depending on your personal preference, or aim with the gyroscope built into the machine by turning the the 3DS, if this appeals to you, and for the most part this works well enough once you get used to it. 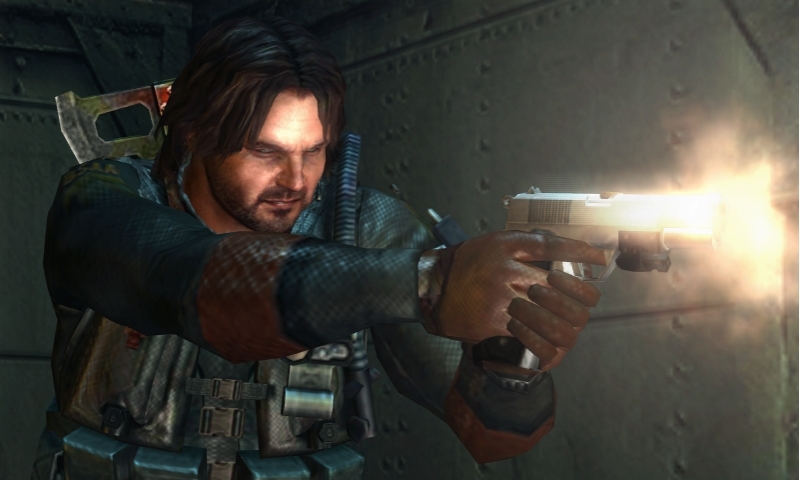 Perhaps best of all, however, is that the game allows you to move while aiming across all of the control schemes, something players have been clamoring for since Resident Evil 5 (if not earlier), so for those who were waiting for this addition, your moment has arrived. As a side note, regarding the Circle Pad Pro in general: for all of the general disdain the device may have acquired during its initial announcement, it’s actually not a bad little device, and it works great here. The device itself retails for twenty dollars, and is Gamestop exclusive (though there are apparently people on Amazon who think it’s reasonable to resell it for around sixty), for those who would want to acquire this thing. At this point the attachment is only set up for use with this and Metal Gear Solid 3D: Snake Eater, but it’s likely other games will make use of it at some point. It operates off of one AAA battery and, according to Nintendo, runs around four hundred and eighty hours off of said battery, so you’ll likely not have to change it for a while. Insofar as using the actual device is concerned, the CPP adds not only a second analog stick to the mix, but also adds two additional triggers, which are vitally useful here. It also leaves the headset jack, volume control and power input open for access as needed while covering the cartridge slot… and also the IR port, stylus and wireless switch, which may be vaguely annoying at times. The system is also left a good bit larger for the addition, and ends up being about the size of the PS Vita, but thicker, which can make portability problematic, especially for cases designed for just the console. Still, the CCP is fairly inexpensive comparatively and works fantastic, so if you don’t want to wait for Nintendo to get around to releasing the 3DSi or whatever they’re going to call it, it’s worth picking up. Moving on, the most interesting new change of the lot is the search tool you’re given early in the game. By pressing Up on the D-Pad or tapping the icon on the touch screen, your character pulls the tool out and holds it as if it were a gun, which is basically how it functions: point and shoot. 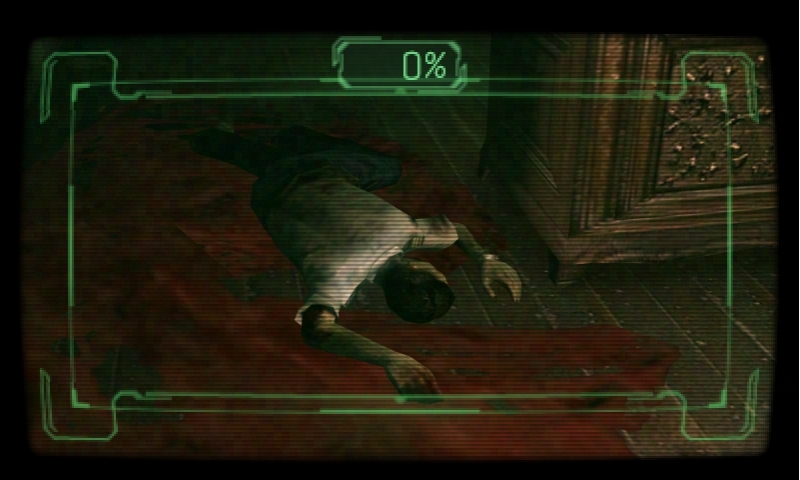 Rather than dealing damage, however, the tool allows you to find hidden items in the environment and scan enemies, either alive or dead. 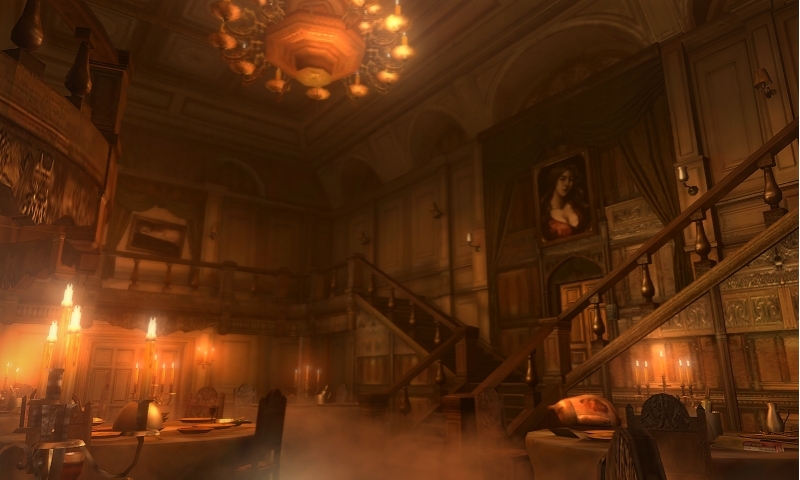 When searching for items, you’ll look around the area and, if something is hidden, a yellow light will pop up in the corner telling you as such. As you look around you’ll notice a circular indicator on the hidden item, and if you center the scanner on the item and hold down the fire button, you’ll scan the item and reveal it, allowing you to claim it as your own. These items are mostly either plot specific items or ammo and healing power-ups, but the odd custom parts will show up doing so, and you can also find hidden handprints around the game world to scan, so it pays to keep an eye out whenever possible. Scanning enemies works in much the same way: target an enemy, hold down the fire button to scan it, and wait until finished. 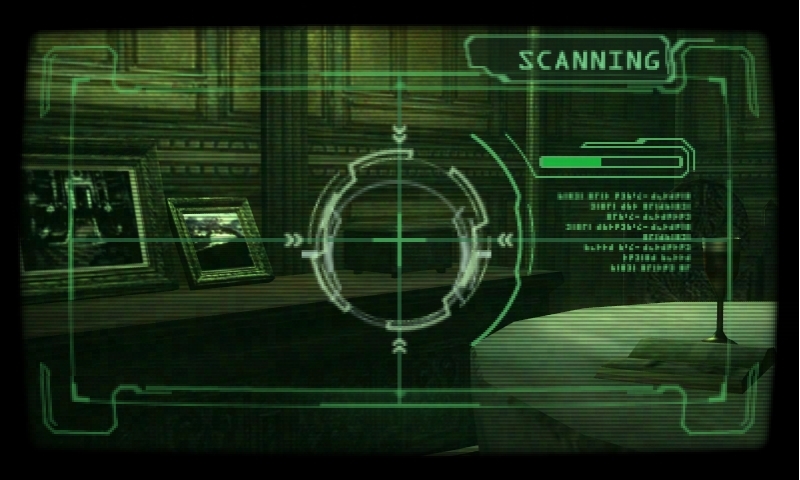 However, instead of providing any inventory additions on its own, scanning enemies instead fills a scan bar at the top of the screen for each scan you perform. Once the bar is filled, it resets to zero and you’re automatically given a healing herb for your troubles, which allows you to keep your health supplies high as you progress. 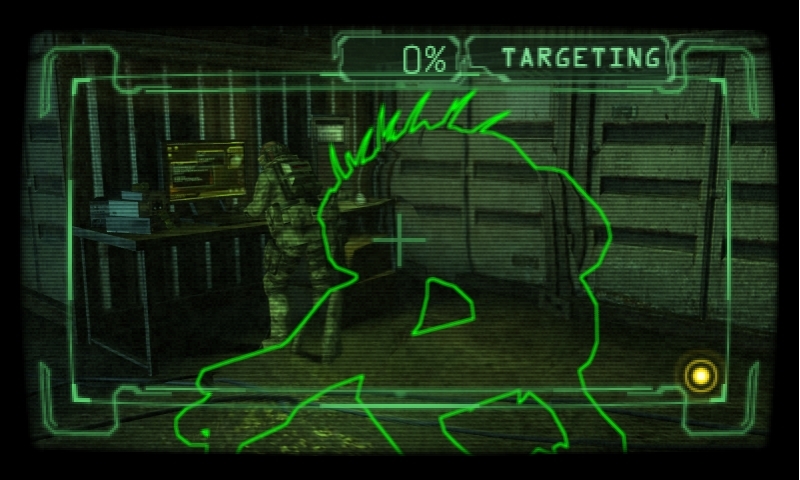 Scanning living enemies is more profitable than scanning dead ones, and larger boss-like enemies provide more points and even the opportunity to scan them multiple times, but the risk of scanning something that’s trying to kill you makes it a risk to try, so it’s fairly important to be aware of this so as not to get smeared. 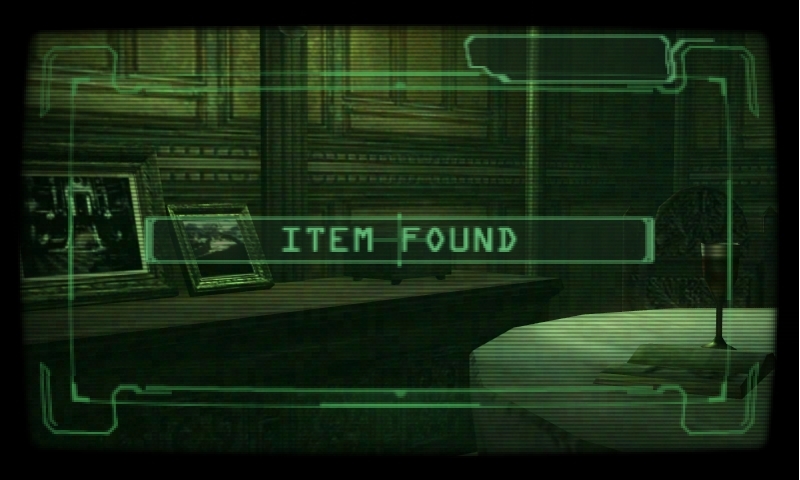 The game also makes decent use of the touch screen, in addition to the inventory management functions noted previously, as the odd puzzles will pop up that require you to use it. This mostly involves unscrewing door panels and realigning the nodes inside to generate power and allow progress, though a couple other novelties, such as using a fingerprint scanner by actually pressing your finger to the touchscreen, pop up now and again to keep things lively. These elements are novel and work fine overall, so you’ll likely not look forward to them per say, but you’ll not likely find them annoying either. 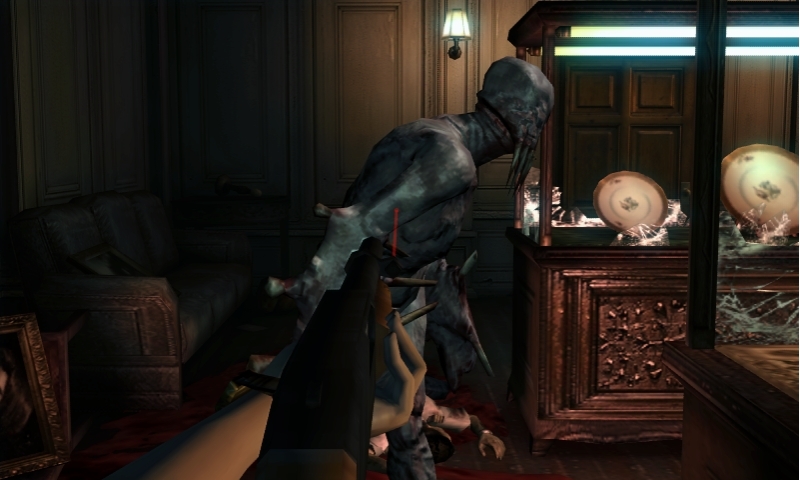 The game also incorporates swimming mechanics, as you’ll spend a decent amount of time in or underwater, which mostly incorporates using the triggers to swim and the sticks to look around. 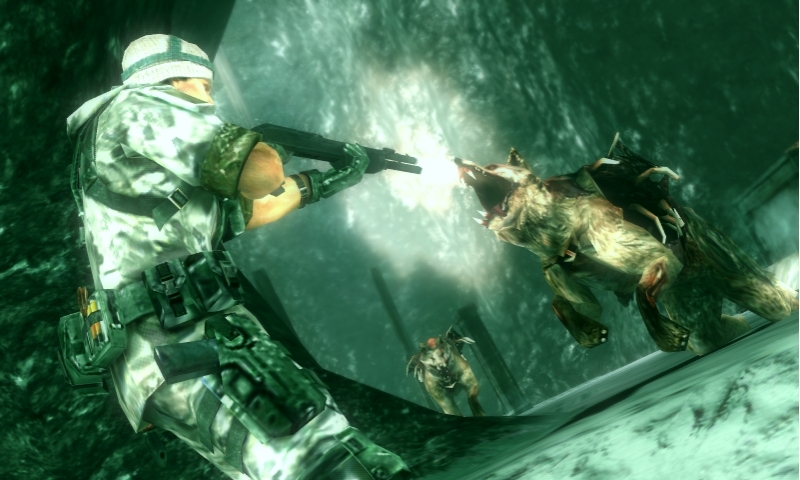 You can’t fight directly while underwater, but you’ll find a few different types of sub-weapons that are useful for taking out enemies in the odd cases where combat is unavoidable, and you’ll need to routinely surface for air in all but one section, which adds to the puzzle solving elements a bit. Speaking of sub-weapons, let’s address them a bit. 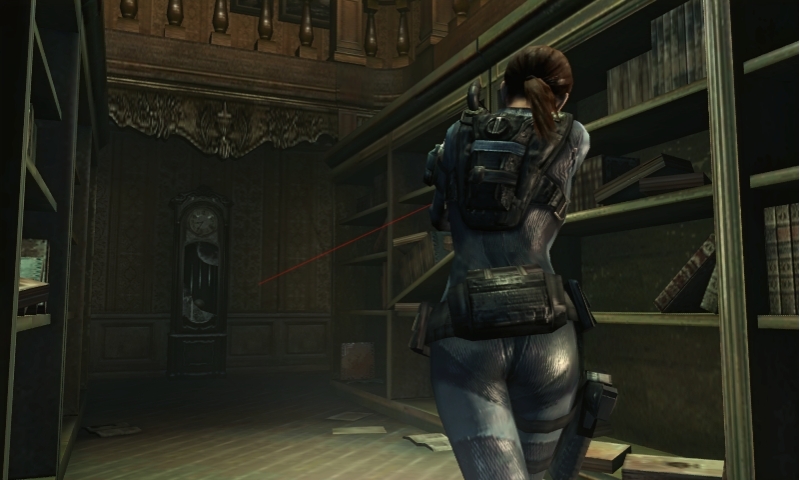 In the more recent franchise titles, you’d have your knife armed at all times and be able to carry explosives that took up inventory space to use if needed, but Resident Evil: Revelations does away with all of that. 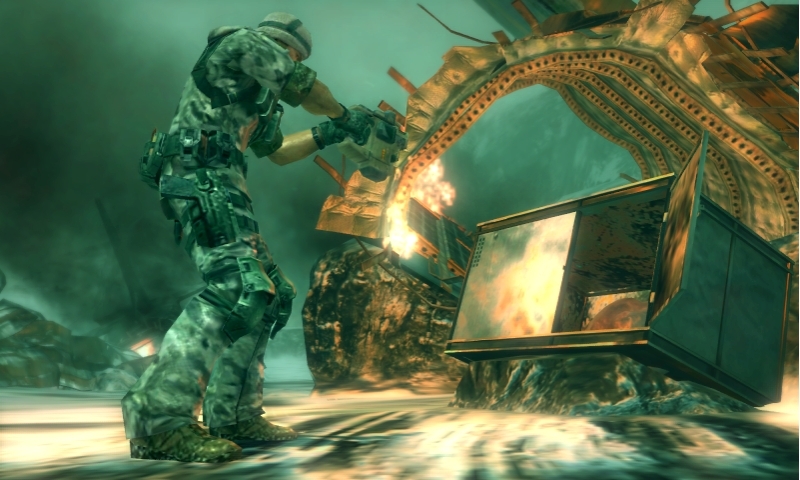 Instead, your knife and any explosives you might find fall under the sub-weapons category, allowing you to swap between them with a press of the left direction on the D-Pad, and use them with the sub-weapon button, depending on your layout. This makes weapon management dramatically easier than in prior games, as all of your tools are available to you whenever you need them, though it also means that, without a set amount of inventory space, you’re instead given specific limits on how much of anything you can carry. To work around this, you’ll also find the odd packs lying around here and there that expand your carrying capacity of various things (mostly ammo), so you’ll be able to carry around more of the things you need at one time, making life a good bit easier in the process. 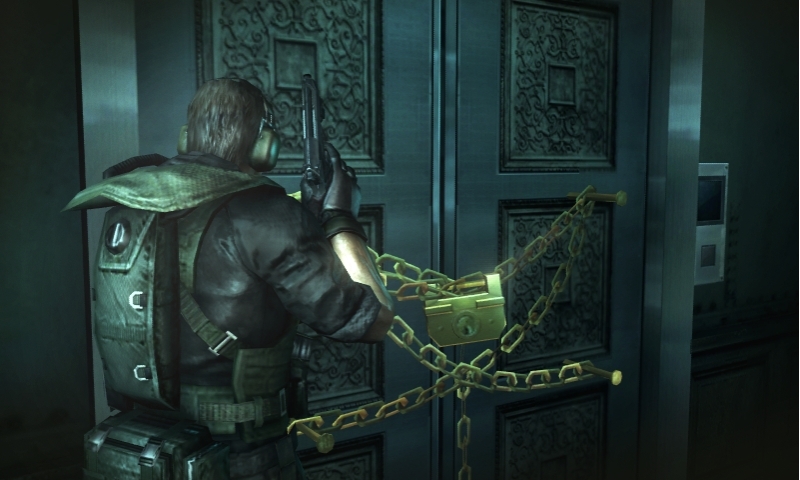 Now, with a three weapon limit and the oft located but never explained Custom Parts that popped up in the demo, it was apparent that some sort of weapon management system would be in place in the game, and for the most part, it’s solid. 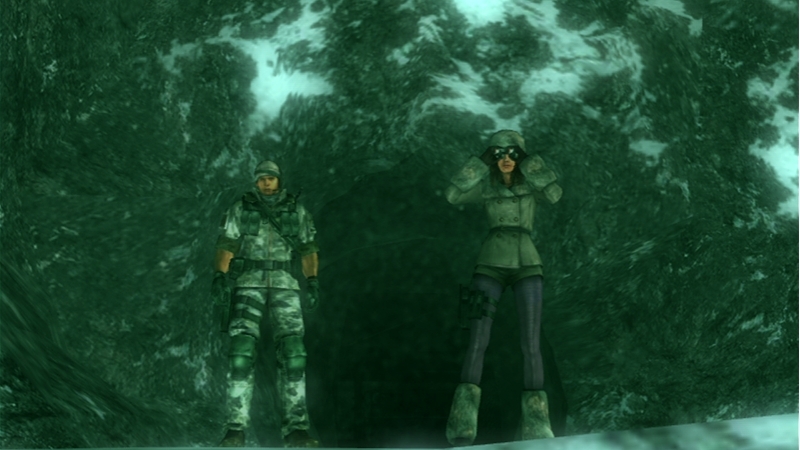 As you traverse the different locations, usually while playing as Jill, you’ll find large green containers that you can interact with. These are weapon storage boxes, which allow you to store and upgrade your weaponry as needed. Once you open the box, you’re dropped into an inventory management screen that allows you to swap out your weapons (on the top) from anything you have in storage (from the bottom). Further, should you happen to find a new weapon somewhere in the game world, whatever weapon you dropped to pick it up will also appear back in the storage box, ready and waiting for you, making weapon trading more user friendly than it would have been otherwise. The Custom Parts you find will also make their usefulness known here, as any time you open the weapon storage with either unidentified Custom Parts or Illegal Custom Parts (which are better overall), the game will helpfully tell you what, exactly, you picked up. You can then examine a weapon to add parts to it, depending on how many slots it has, though certain parts can only be added to certain gun types as well. 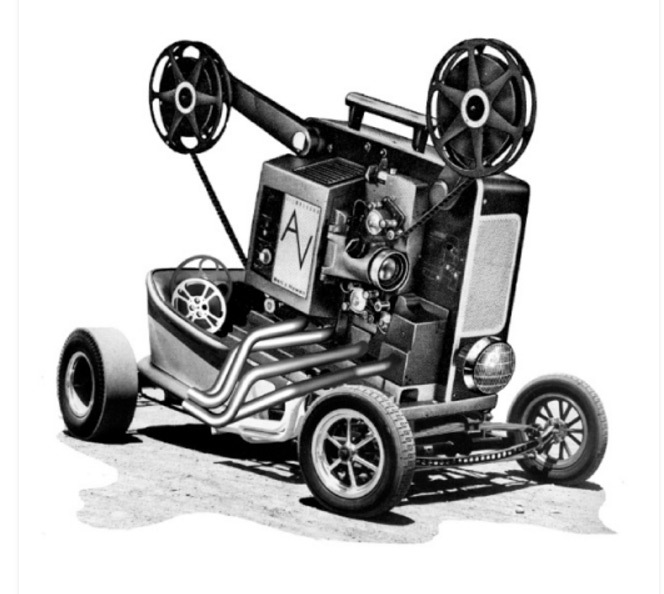 Additionally, parts can have various levels of capability, so if you find a level one damage booster, then later find a level five damage booster, feel free to swap that out as needed. It’s also good to note that parts aren’t permanently tied to the weapon you stick them on, so if you find a better hand pistol you can transition the parts from the old one to the new one easily, though you can’t stack multiple parts of the same type, unfortunately, so no one-shot pistols, alas. Still, the mechanic works fairly well, all in all, and it’s user friendly and doesn’t require the suspension of disbelief a currency-based system on an abandoned ship might have, for instance. 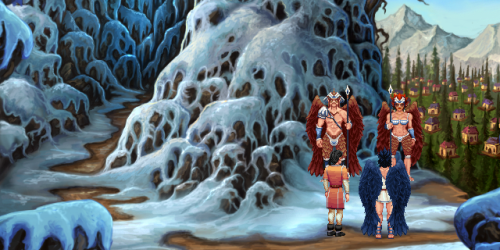 The game also features various missions you can clear as you play through the game, which may be as simple as completing chapters or as complex as dodging a certain amount of attacks or finding a certain amount of handprints in the game world. 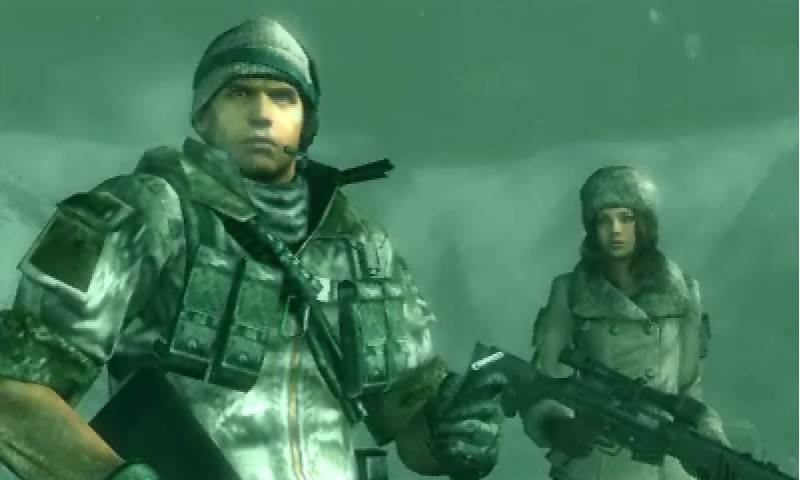 For completing the missions, you’ll earn power-ups or weapons you can use in the story mode or bonuses for Raid Mode, the multiplayer game mode, making completing these missions well worth the effort. 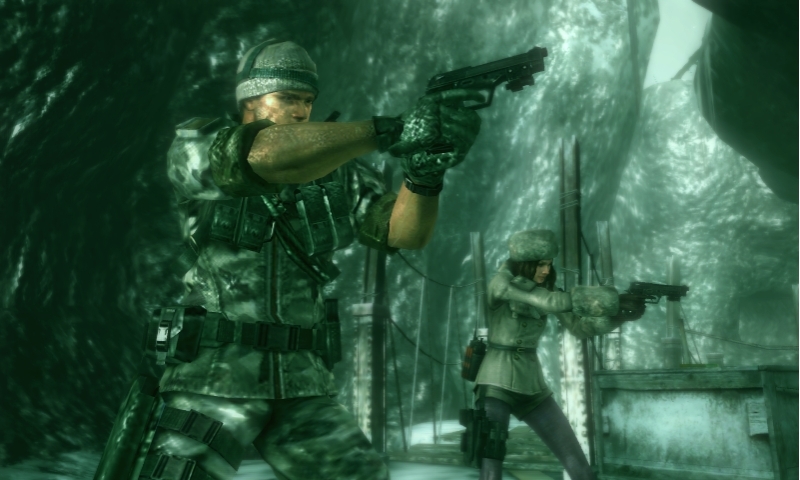 Raid Mode itself also deserves a good amount of explanation, because it’s almost an entirely different animal from the prior franchise multiplayer mode, The Mercenaries, and is actually much more interesting. 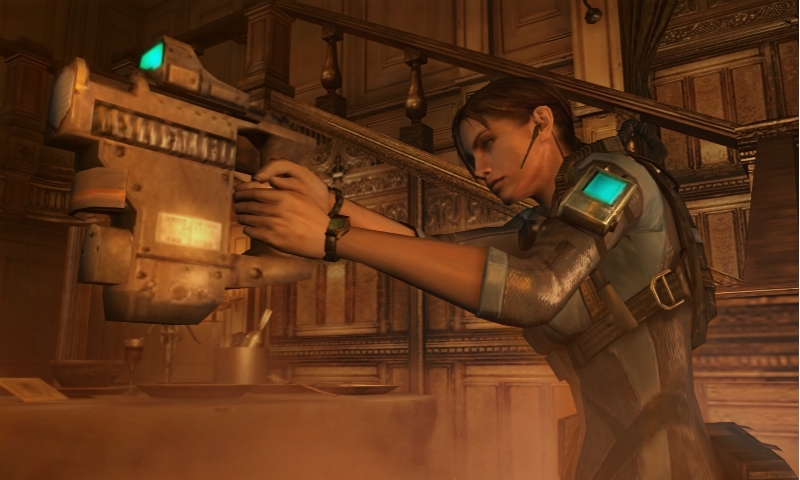 When you start off Raid Mode, you can choose from any of the available characters, each of whom are automatically better than the others at something, be it using pistols, rifles, machine guns, or what have you. 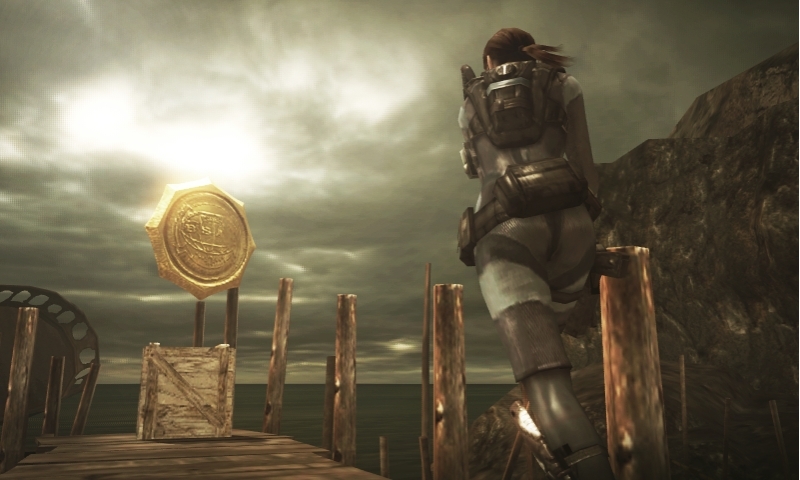 From there, you jump into one of the missions available, which tasks you to find the marker in the game world that completes the mission, using only what you have on your person and what you find in the environment. 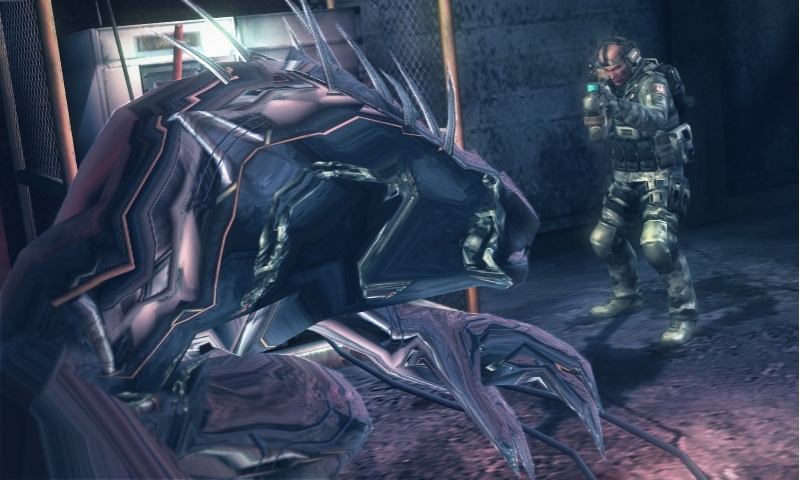 As you go, you’ll encounter enemies of different types, potentially with special effects applied to them, that you’ll have to avoid or demolish, as well as new weapons and attachments to play with. Completing missions earns you bonus points you can use to buy new gear in the shop, including new weapons, attachments and ammo/health refills/upgrades. 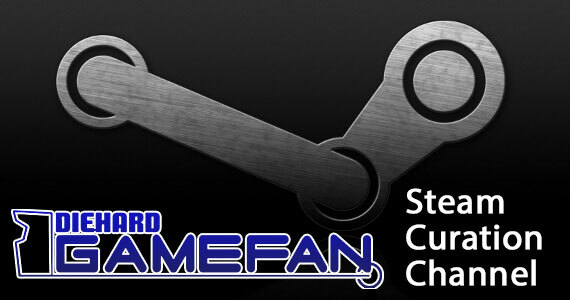 You can also exchange Play Coins for some upgrades if you’d rather, and the game scales weapons to your character level, offering new guns with added damage or slots to scale as you level up. So, in other words, it’s Resident Evil by way of Diablo for up to two players, online and off, and it’s absolutely awesome alone or with friends. 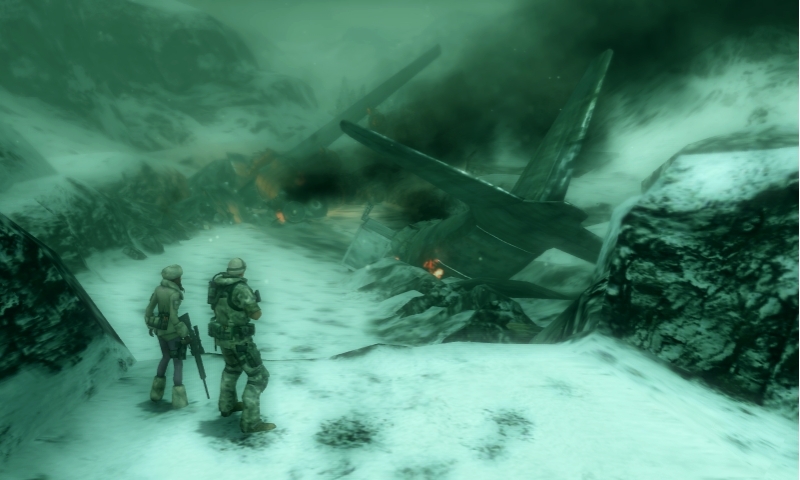 You can plow through the story in about ten to fifteen hours, depending on how long you spend searching around for hidden items and handprints and such, though the campaign also offers a New Game Plus mode that allows you to go back through the game on higher difficulties with your gear intact. Raid Mode is also a great time, featuring sixty plus levels of monster slaying and item collecting across three difficulties that you can play alone or with a friend, either online or off, to unlock new characters, costumes and fantastic gear. There are also a large amount of missions to complete across both the campaign and Raid Mode that unlock new toys in both modes, giving you even more reason to keep playing both. You can unlock new characters and costumes for Raid Mode through playing through the different modes as well, so you needn’t go through in the same old duds even if you like your chosen character. 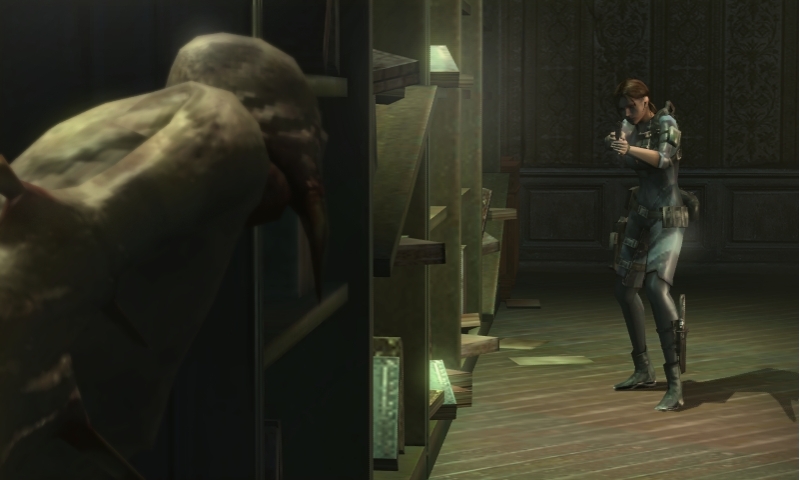 In other words, Resident Evil: Revelations is an exceptionally in-depth game, both as a Resident Evil title and as a 3DS game, and it’s easily stuffed with replay value for anyone who is a fan or just wants something robust to play. Which doesn’t mean it’s perfect, unfortunately. One notable flaw with the game is that, sadly, the swimming sections are mechanically unfriendly with any play style, which would be mildly annoying normally, but becomes excessively frustrating when dealing with enemies, especially when you’re not able to fight back. The inability to manually save can also be vexing when you need to drop out for a while, and while the game saves on its own frequently enough to not be too problematic, there are times where this can be annoying. 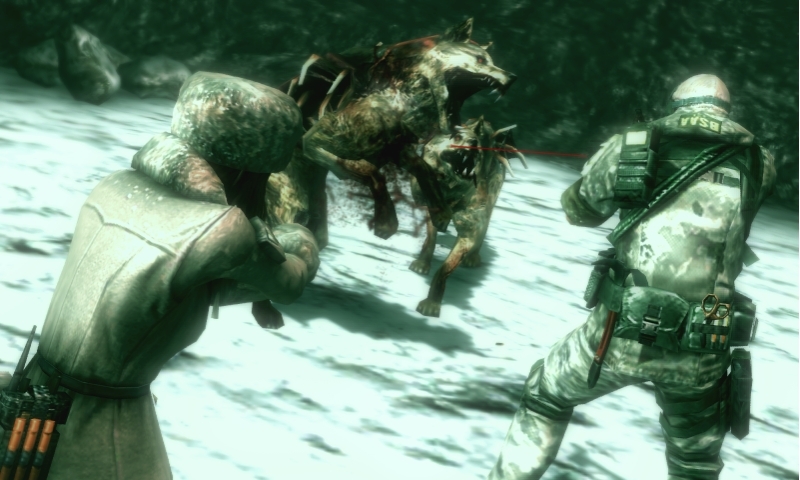 Also, while the game incorporates the team concept of Resident Evil 5 into the campaign, there’s no option to play the campaign cooperatively, which is disappointing, as your CPU allies are often not that useful on their own. They don’t seem to do any sort of appreciable damage to enemies and the enemies rarely bother to target them; while this means that they are unlikely to die and cost you a mission (this may be impossible as it never happened to me), they are ALSO basically useless. There seems to be literally no point to your partners, either as a distraction, a meat shield or a damage dealer, and for the most part it really seems like there was no purpose including them except for personality, which just seems silly, all in all. 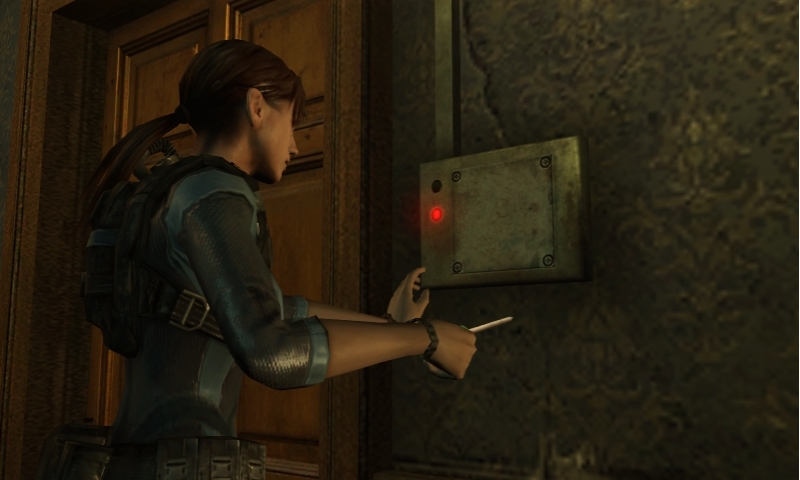 Finally, while the constantly switching perspective of the storyline is neat from a narrative standpoint, from a mechanical standpoint it can be frustrating to keep switching to lower powered characters after spending time playing as your beefed up Jill. 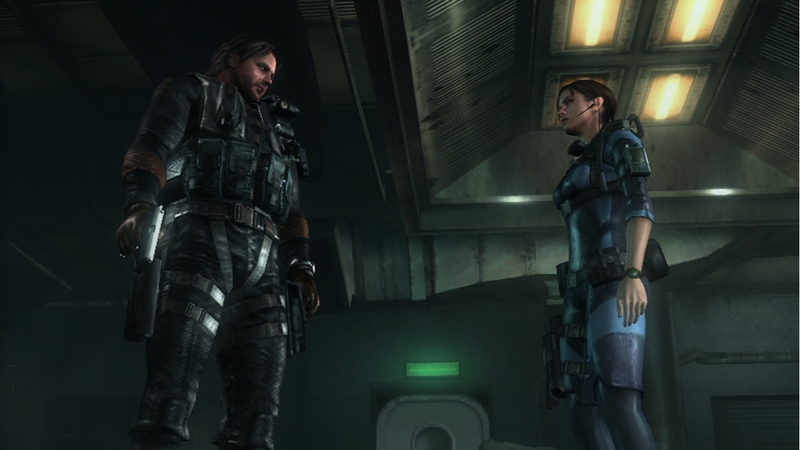 None of the other characters you’ll play as in the campaign can upgrade their gear at all, and while their segments are often short and not terribly involved in comparison, it’s still disappointing that you can’t really do much with any of the other characters you play as given the options you have for Jill. 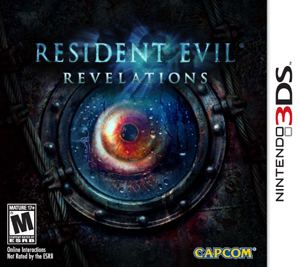 Honestly, aside from a couple of minor missed opportunities, Resident Evil: Revelations is basically one of the best reasons to own a 3DS right now, as it does the majority of what it does very well across every possible category. The plot is basically about as enjoyably insane as those of the prior games in the series, and the game looks and sounds fantastic in general and for a 3DS title. The gameplay mechanics have been simplified in reasonable ways to work with the 3DS console and the controls are responsive and usable no matter what control scheme you work with, though the Circle Pad Pro is obviously the best option. There’s an astonishingly large amount of content in the game, both in the main campaign and in the multiplayer Raid Mode, and anyone who is a fan of the franchise or simply shooting things until they stop moving will find the game to be a great investment that justifies its asking price. 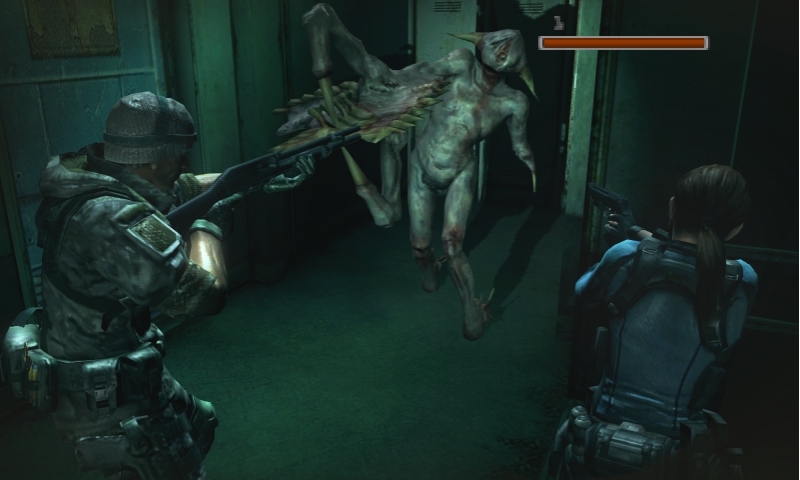 The swimming sections are a little frustrating when enemies get into the mix, your CPU allies basically seem to be window dressing instead of anything useful, the lack of a manual save can be vexing at times, and the fact that you can’t upgrade anyone but Jill in the campaign is unfortunate, but honestly, none of these complaints are game breaking in any sense. 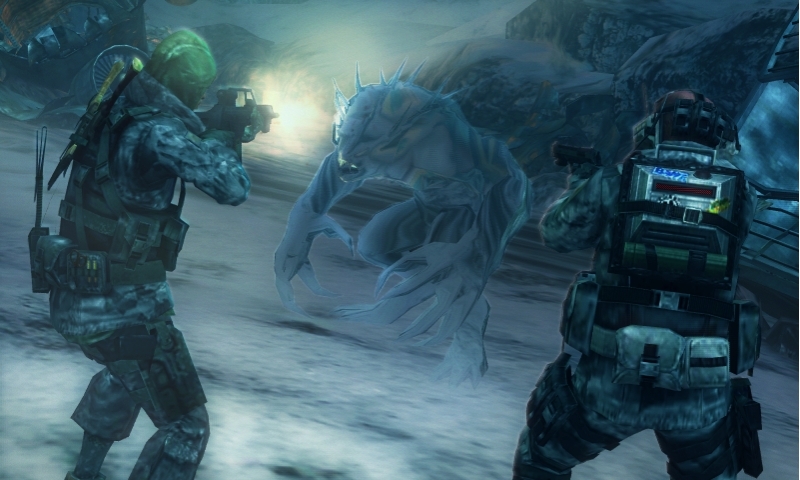 Resident Evil: Revelations is basically an excellent reason to pick up a 3DS, as it’s one of the best exclusive games on the console at this point, and it’s easily worth the asking price for fans and newcomers alike. 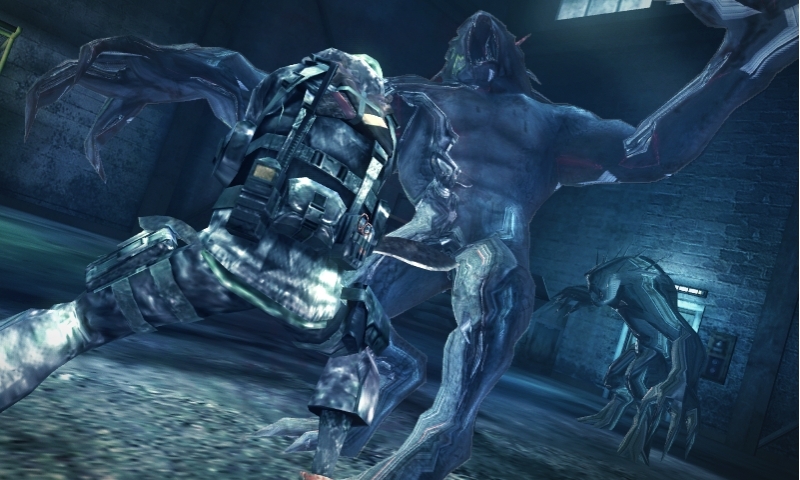 Resident Evil: Revelations is an excellent start to Capcom’s three franchise releases this year, as it’s not only a great game for the series, but also one of the best games to come out on the 3DS so far. The story is your standard over the top but enjoyable franchise fare, and the game is excellently presented on the console from both a visual and an aural perspective. The mechanics have been modified to work on the 3DS console, which they manage to do very well, and the controls are simple enough to work with on their own, though with the Circle Pad Pro add-on the game is noticeably improved overall. 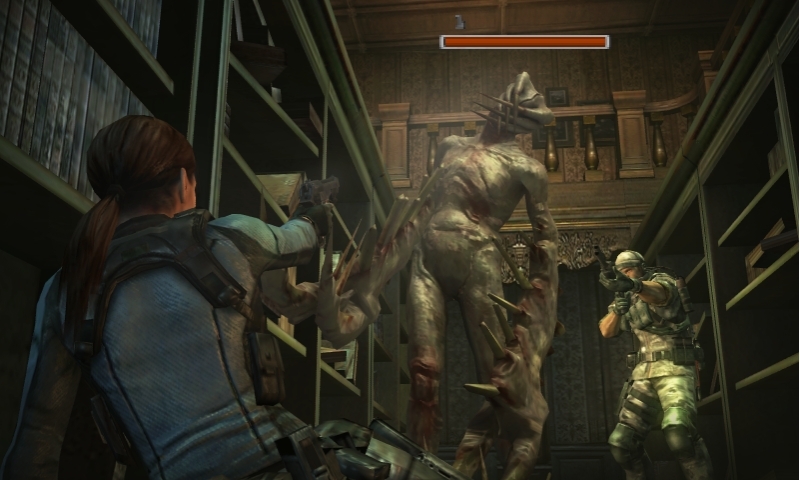 The game adds in its own unique mechanics to keep things interesting, and between the lengthy campaign and the extensive and well implemented Raid Mode you’ll have plenty of reasons to come back to the game long after you’ve completed it. 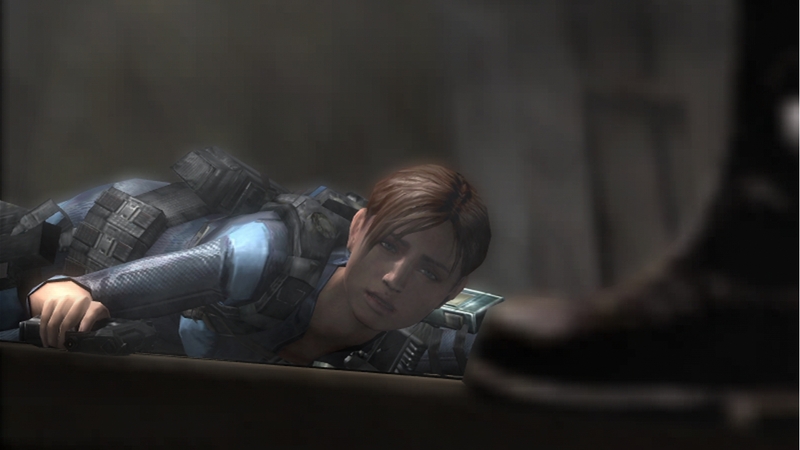 The swimming sections can be frustrating when enemies get involved, the CPU allies the game sticks you with seem to be more for show than any kind of function, the lack of a manual save can be a pain at times and the lack of custom options for anyone but Jill is unfortunate, but none of these elements is significantly problematic. 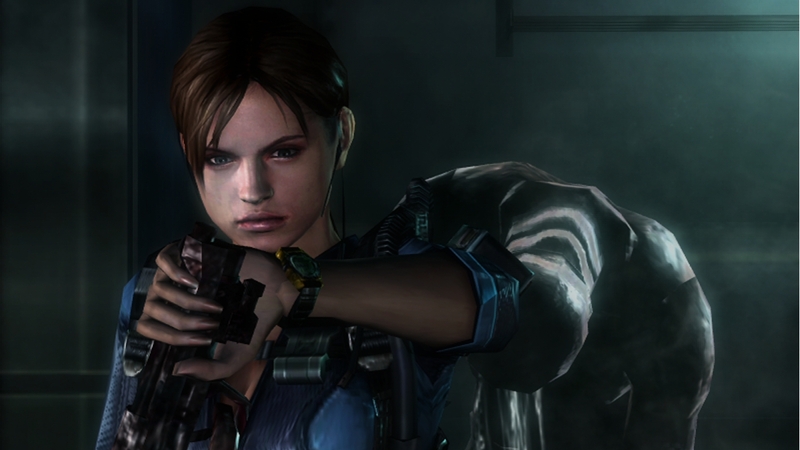 All in all, Resident Evil: Revelations is a fantastic second shot from Capcom after The Mercenaries 3D, and if the rest of the franchise releases this year are as good, this will be a great year for Capcom indeed.